Bring the water to a boil. Bring the water to a boil over medium-high heat. Add salt. Pour the polenta into the boiling water, whisking gently. Continue whisking until polenta is thick. Turn down the heat to low and continue whisking. Cook covered about 15-20 minutes, stirring every couple minutes and making sure nothing sticks to the bottom. Stir in butter, if using. Stir the cheese and butter into the polenta, if using. Then grate one clove of garlic using micro plane into the polenta. Mix well. While polenta is cooking, heat a pat of butter or a tsp of avocado oil in a medium sized pan. Add spinach and shaved zucchini. Sauté until veggies are soft. You may need to add a little water to help cook veggies down. Once veggies are soft, add in marinara sauce and simmer together for about 10 minutes. Add in crushed chili pepper and fresh basil. Remove from heat. 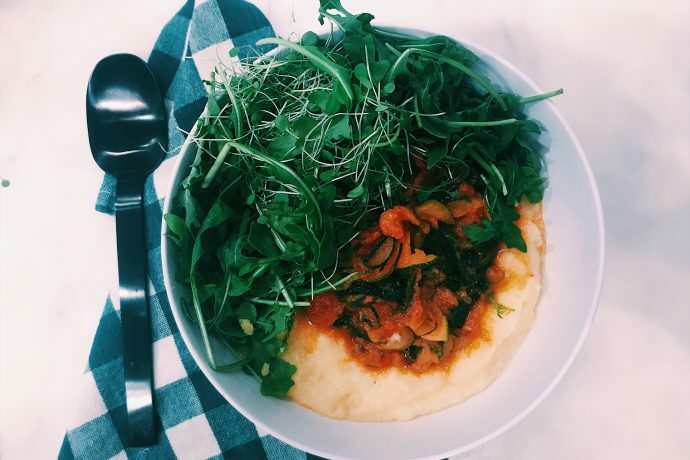 Using individual sized soup bowls, spoon in polenta, topping with veggie marinara mixture, top with fresh arugula and microgreens. Serve hot.